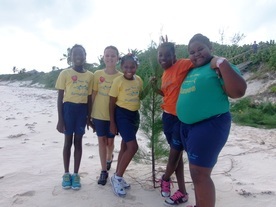 Sandwatch in The Bahamas has been championed by Candace Key, Hope Town, Abaco and former Principal of Hope Town Primary School. Other partners include the Ministry of Education and Bahamas National Commission for UNESCO. Schools involved include: Hope Town Primary School, Bennet's Harbour Primary School, Gregory Town Primary School, C.W. Sawyer Primary School, Thelma Gibson Primary School, Forest Heights Academy, Amy Roberts Primary School, Man-O-War Cay School, Cherokee Sound School, Abaco Central High School, S.C. Bootle High School. The sea oats the school planted a couple years ago to help restore and strengthen the dune damaged by the latest hurricane, are thriving and making the school Sandwatchers proud of their work. Unfortunately they are also being joined on the dunes by other plants some of which are invasive species and will overrun the sea oats if left in place. The most prevalent plants invading the dune are casuarinas (Australian Pine) and Hawaiian Sea grape. The Hawaiian Sea grape was popular on our island as a quick growing plant that can be easily trimmed to make an attractive hedge. Unfortunately, they know no boundaries and spread rapidly overtaking other native species. Casuarina needles once they fall allow no plants to exist in that area. - Click here to see more! Below are the homepages of the Bahamian school involved in Sandwatch with details of their schools, communities and participation.